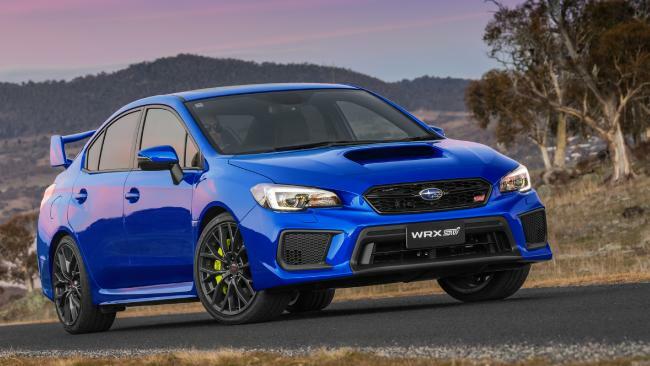 The Subaru WRX STI is a hero car to many thanks to its stellar motorsport career and, priced from $55,527 on the road, it's among the best value, genuine all-round performance cars money can buy. Four doors, five seats and a decent sized sedan boot bring practical benefits, too, but can it serve both as a family daily driver and a weekend plaything? IAIN: A living legend, this one. What teenager in the 1990s didn't long for a Subaru WRX? JULES: Well, me. Revheads used to have them, with giant wheels and exhausts, ridiculous suspension and booming audio, right? JULES: I remember the WRX in the Colin McRae Rally video game. Shouldn't it have gold wheels and lighter blue paint? IAIN: Fair call. You can still get WRC blue but no gold wheels sadly. Ours is a bit subtler in dark blue. JULES: Not subtle, no. Giant rear wing? Massive bonnet scoop? Painted glow-in-the-dark brake calipers? I've got to do the school run in this thing. IAIN: Well you'll be the raciest mum in the car park then, plus the kids love it. They knew it was a race car from the barking of the 2.5-litre turbo boxer. You don't need the rear wing by the way, it's a $300 option. JULES: Even so, surely for the $55,000 we could get plenty of other talented performance cars? 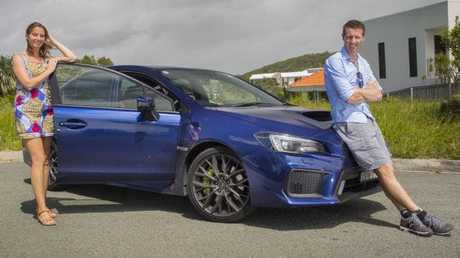 IAIN: Rivals for similar money include the VW Golf R, Honda Civic Type R, Ford Focus RS, Renault Megane RS, or spend a bit more and get a BMW M140i … all hatchbacks. JULES: Well, it ticks the sporty boxes. 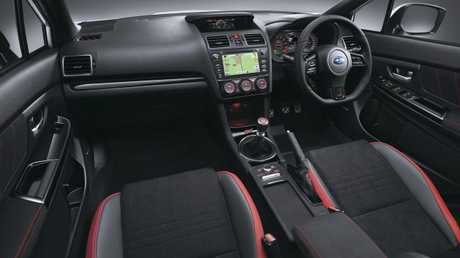 Alcantara trim, manual gearbox, metal pedals, chunky steering wheel plus stitching, seat sides and seat belts in red. IAIN: Other than that, it's a bit dark and dated but feels very well screwed together. JULES: It's not dated, it's a tech fest. There are information screens everywhere. It's hard to pick out relevant data when driving. I don't care about my cornering g-force or throttle percentage, a digital speedo is fine. IAIN: All that on-board telemetry will be handy at the racetrack. The steering wheel is a sea of buttons though. It all takes a lot of learning. JULES: The audio is incredible but, even with all those screens, why no Apple CarPlay? Criminal. IAIN: It's not great for the family either. The kids have plenty of space for their car seats in the back but I couldn't fit even one bike in the boot. Hot hatches do the trick there. JULES: I love a manual but not this one in school traffic. The clutch is heavy and it's hard not to bunny hop away unless you nail the throttle. IAIN: Yeah, that's not really good form outside the school gates. It's a hugely eager engine and certainly prefers to be worked. JULES: The performance is awesome but we just haven't got the roads to do it justice. IAIN: It's not that powerful or quick though. For a turbo car these days, 221kW isn't huge and 0-100km/h in 5.2-seconds is fast rather than hyper. 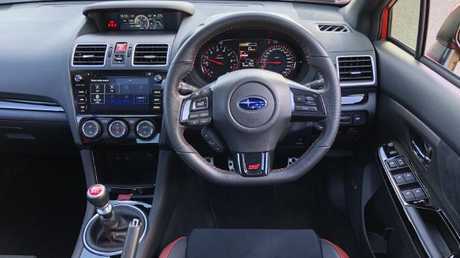 It's the STI's cornering speed that will truly show where your money's going. Show us the money: STI’s cornering ability rewards the investment. JULES: That must be why it's so stiff and uncomfortable. Not a daily driver for me, even though the sport seats were unexpectedly comfortable on a long drive. IAIN: I reckon it could just about do daily duties without too many chiro appointments. 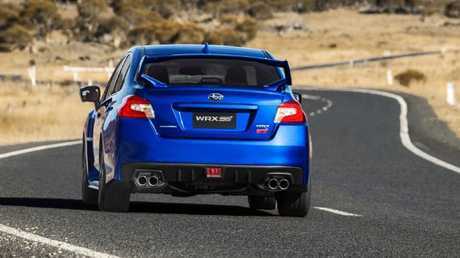 But if you don't intend to take one to the track, save your money and get a normal WRX. JULES: I really enjoyed the performance when out on rural roads but I didn't enjoy taking it to the supermarket. It's such a male car. I felt people were judging me for driving one. They were expecting a hoon to climb out. IAIN: You may get mistaken for Molly Taylor; she was 2016 Australian Rally Champion in an STI, you know. JULES: I bet her rally version doesn't have a rear camera. That was handy and the dash monitor is very good too. But for around town I was shocked by how much fuel it drank. I averaged over 15L/100km there. 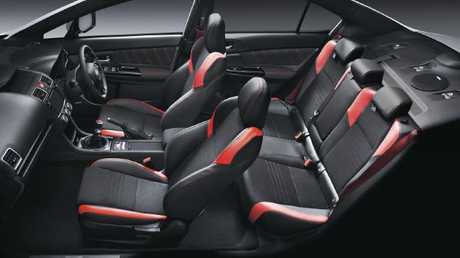 Hoon’s cocoon: Supportive sports seats, though suspension is stiff. IAIN: Leadfoot. It needs premium 98 too. to be close to the redline to get the most shove; the turbo lag can be surprising otherwise. JULES: It loves being driven fast and that dirt road section we did showed off how playful it could be, yet safe with brilliant brakes and all the technology underneath. IAIN: It's so stable and grippy in the turns but, yes, it feels as if it was made for dirt road shenanigans. In Sport Sharp mode the engine felt more responsive. I had a play with the adjustable centre differential to send a bit more torque to the rear wheels. STI: Stable, grippy but ready for dirt road shenanigans. JULES: I told you not to touch that button. I was happier with how safe it felt in full all-wheel drive mode. JULES: It's super fast, clever and good value but its style is just too male. And it's not easy telling your friends you have an STI. It's a no for me. IAIN: I see your point. 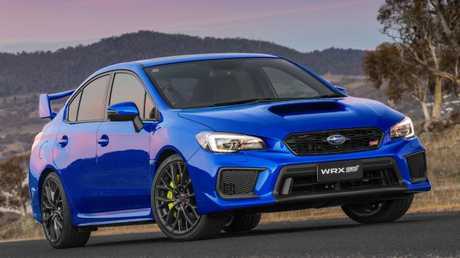 It's a yes for me but only if you plan to use your WRX STI on the track or if you live down a long, twisty gravel back road.